OUR FLANNEL SHIRTS ARE AS WARM AS A CUP OF COCOA! The great flannel shirts you had, what do you remember about them? Not the pattern. Not the sleeves. Maybe it was the collar, the way it caressed your neck. Maybe it made a smell. Maybe it was the easy way it hung on you, like a drunk temp at an office party. Friend, this is a flannel. Most flannel shirts weigh eight ounces, they’re crap. This weighs ten ounces. When it’s so cold outside your balls shrink up like croutons, those extra two ounces are ounces of gold. But you can’t have these shirts. They are not for the likes of you. These shirts are for preferred customers. If you called last year, you could have bought one, maybe, but not now. It’s too late, they’re sold out. They won’t be avail- Huh? What’s that, Gladys? We do have a few in stock? Tonight only? Well, pal, you just got lucky. You’ve got eight hours to get in on the ground floor. Of course you can talk it over with your wife. How many should I put you down for? Seven? Nine? AND THE ALL-COTTON FABRIC GUARANTEES COMFORT! You bitched about our stirrup pants. We heard you. Christ Almighty, everybody in the state heard you…. What ever happened to straps that held pants up? I would really like to know if the editors got together in their offices and roared their heads off at this collection: it seems unlikely. 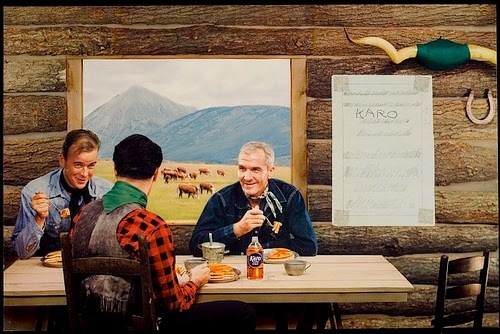 The top picture is an advert for Karo Syrup from George Eastman House. 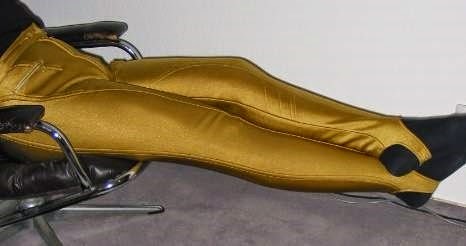 The stirrup pants come from Wikimedia Commons. Moira, on the face of it this sounds interesting and while I like to read The New Yorker" occasionally, I often despair at the length of the articles and fiction. Sometimes there's just not enough time to read through the whole thing. I know - the New Yorker is good, but it is like reading an extra novel each week, and it can get too much. I think subscribers end up with unread piles of them... you have to be ruthless about picking your articles in my experience. Thanks - not one for me. You've saved me the bother. Can't argue with that - this book was a wasted opportunity, and cannot recommend it. The book doesn't sound entertaining (and too big) but your post is. So thanks for that. It's a huge book, so I feel I'm doing everyone a favour! Thanks Tracy.